December 14, 2011 - Boeing on Monday completed all flight testing needed for the B-52 Combat Network Communications Technology (CONECT) program to receive low rate initial production (LRIP) authorization from the U.S. Air Force. The flight test program was conducted at Edwards Air Force Base, Calif., by Boeing and the Air Force. Milestone C authorization for low-rate initial production is expected in mid-2012. The CONECT modification provides the ability to change a mission, as well as change the target of a weapon, while the B-52 is in flight. The system provides increased situational awareness for B-52 crews by adding several communication data links and full-color LCD displays with real-time intelligence feeds overlaid on moving maps. 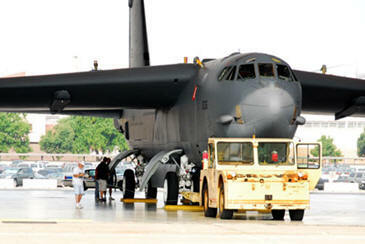 CONECT also enables future B-52 improvements with its onboard, high-speed network. Boeing defense programs are required to meet internal Company criteria ensuring the systems and platforms are delivered with the inherent ability to seamlessly share data and voice communications via mobile wireless networks. This capability known as interoperability is a key tenet of network centric operations, in which networked systems share information and are able to dynamically reallocate resources based upon operational needs. The Boeing criteria for NCO readiness incorporate customer requirements while helping to ensure the interoperability of enduring Boeing platforms. Boeing Strategic Architecture, the organization that developed the collection of interoperability standards and interfaces known as the Strategic Architecture Reference Model, is responsible for setting the internal criteria and certifying each of the programs. Compatibility with the SARM is among Boeing's key internal NCO requirements and ensures Boeing-built systems remain compatible with standards recommended by the newly formed Network Centric Operations Industry Consortium, of which Boeing is a founding member. "This important milestone is also a solid indication of Boeing's commitment to provide our nation's warfighters with the networked tools and technologies they need to prevail in battle and return safely from the fight," said Strategic Architecture Vice President Carl O'Berry. "It also demonstrates the adaptability of the reference model as an architecture approach enabling new systems, such as Future Combat Systems, and Joint Tactical Radio Systems as well as fielded systems, such as the B-52, to operate in a network centric environment." The B-52 Stratofortress has proven its flexibility over 40 years, from dropping bombs at 50,000 feet to providing close-air support. Through this upgrade, these planes will be able to share data seamlessly with the newest platforms that are now being built. The B-52 Combat Network Communications Technology (CONECT) program is now on its way at the Wichita Development and Modification Center. The program will improve the B-52's ability to share data with other military systems and platforms through enhanced communications, added tactical data links for increased situational awareness, and new technology to allow aircraft crews to dynamically retask missions and weapons during flight. "We see the B-52 CONECT program as the enabler for Network-Centric operational capability on the B-52. CONECT will allow B-52 mission transformation through information integration, both on-board and off-board the aircraft, creating new warfighting roles not previously anticipated," noted Scot Oathout, B-52 program manager for the IDS Aerospace Support business. Boeing built a total of 744 B-52 aircraft. The first B-52 flew in 1954. The last one built, a B-52H, was delivered in October 1962. Today 94 of the H model planes remain in the Air Force inventory, assigned to the Air Combat Command and the Air Force Reserves.